Support the student occupations against the illegal occupation in Palestine! 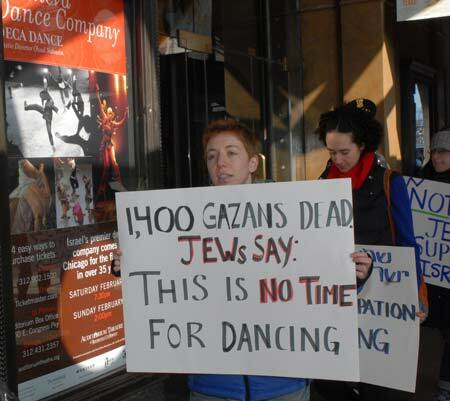 A protester at a Chicago performance of Israel's Batsheva Dance Company. Photo by and copyright Christine Geovanis, HammerHard MediaWorks, Chicago. “I think it’s not really going to make a difference to boycott a dance company…. The boycott is just preventing something that is good…. I think artists belong to a group of people who don’t represent the ugly side of Israel.” — Ohad Naharin, artistic director, Batsheva Dance Company, commenting in Straight.Com, February 12, ahead of Batsheva’s Feb. 20-21 Vancouver engagement. “The Brand Israel project, which was created during [foreign minister Tzipi] Livni’s tenure, seeks to counter the country’s aggressive and religious image abroad, using common marketing tools. If Israel is perceived as a hard, unpleasant place, resembling an armed evangelical village in Texas, then it is worthwhile to reveal softer sides to the West.” – Aluf Benn, Ha’aretz, February 18 “What hast thou done? The voice of thy brother’s blood crieth unto me from the ground…. A fugitive and a vagabond shalt thou be in the Earth.” – The Bible Here’s the context of Batsheva’s North American tour, which culminates March 4 – 7 at the Brooklyn Academy of Music: Rather than alter its genocidal policies towards the Palestinians whom, as an occupying power, it has a legal obligation to *protect*, Israel has responded with a PR campaign, “Brand Israel,” designed to portray its ‘softer’ side and give a veneer of Western civilization to a country whose most recent slaughters in Gaza were barbaric. How could the beautiful bikini-clad Israeli soldiers featured in Maxim magazine in 2007 — in a photo-spread *sponsored* by the Israeli Foreign Ministry — possibly be guilty of the kind of war crimes reported by objective observers in Gaza, including dropping illegal phosperous bombs on a United Nations facility and bombing UN schools as well as hospitals and civilian homes, mowing down civilians after ordering them to leave buildings, killing more than 1300 people a third of whom were children, preventing medical aid from getting to the wounded, etcetera, etcetera? A resolution of the Israeli-Palestinian conflict cannot be achieved within the confines of ‘historical Palestine’. Moshé Machover calls for a socialist approach This article is not written as a polemic against Zionists, social-imperialists and purveyors of similar reactionary ideologies; nor is it aimed at a broad liberal or progressive audience. It is addressed specifically to genuine socialists. I can therefore take certain things for granted. I will take for granted the analysis of the Israeli-Palestinian conflict I have expounded elsewhere: especially in my 2006 Amiel and Melburn Trust lecture.1 But I would like to elaborate on the second part of that lecture, which dealt all too briefly with resolution of the conflict. I will also take it for granted that we socialists reject not only any ideology of colonisation and oppression, but also all nationalism – including the nationalist ideology of an oppressed people struggling for national liberation. This latter precept, while accepted in principle by all genuine socialists, is not always adhered to in political practice. It is all too easy to slide from support for a national liberation struggle – which is our unwavering duty as socialists – into accommodation with the bourgeois or petty bourgeois nationalist ideology of the leadership of that struggle. Wishing – quite correctly – not to appear patronising by preaching from afar to the oppressed masses on how to conduct their struggle and presenting them with a pre-packed programme, socialists often forego an independent critical socialist viewpoint and are content to tail behind this or that brand of radical nationalism. Independent positions such as those advocated in the present article, which were formerly held and defended by significant sections of the revolutionary left, have been abandoned or simply forgotten. They need to be reaffirmed. I have just learnt that my good friend and mentor Joel Kovel has been sacked from Bard College. His book ‘Overcoming Zionism’ published by Pluto, saw the Zionist lobby mobilise against him and his continuing criticism of Israel has unleashed more persecution. Anti-Zionism even from Jewish anti-racists is labelled anti-semitism and suppressed. He is for many of us a bit of a modern Lenin, he coined the term ‘ecosocialism’ and launched a movement that stretches across continents embracing indigenous activists, greens and socialists. To protest, write to the Bard administration: President Leon Botstein president@bard.edu Executive Vice-President Dimitri Papadimitriou dpapadimitrou@bard.edu Joel notes: A fundamental principle of mine is that the educator must criticize the injustices of the world, whether or not this involves him or her in conflict with the powers that be. The systematic failure of the academy to do so plays no small role in the perpetuation of injustice and state violence. In no sphere of political action does this principle apply more vigorously than with the question of Zionism; and in no country is this issue more strategically important than in the United States, given the fact that United States support is necessary for Israel’s behavior. The worse this behavior, the more strenuous must be the suppression of criticism. I take the view, then, that Israeli human rights abuses are deeply engrained in a culture of impunity granted chiefly, though not exclusively, in the United States—which culture arises from suppression of debate and open inquiry within those institutions, such as colleges, whose social role it is to enlighten the public. Therefore, if the world stands outraged at Israeli aggression in Gaza, it should also be outraged at institutions in the United States that grant Israel impunity. In my view, Bard College is one such institution. It has suppressed critical engagement with Israel and Zionism, and therefore has enabled abuses such as have occurred and are occurring in Gaza. This notion is of course, not just descriptive of a place like Bard. It is also the context within which the critic of such a place and the Zionist ideology it enables becomes marginalized, and then removed. Write and protest about this unjust and crudely-motivated political slaughter of a leading researcher! IDF Denies Human Rights Watch, B’Tselem Access to Gaza (Jerusalem, February 22, 2009) – Israel continues to obstruct independent investigations into allegations of laws of war violations by the Israel Defense Forces (IDF) and Hamas military forces in Gaza by preventing independent human rights monitors from entering Gaza, Human Rights Watch and B’Tselem said today. After submitting applications for permission to enter via the Erez crossing in January 2009, the groups faced continued delays from the IDF unit reviewing the applications. In February, the IDF told Human Rights Watch that it had rejected its application. The Israeli military denied B’Tselem’s first request to enter Gaza and has failed to respond to a second. “Israel’s refusal to allow human rights groups access to Gaza raises a strong suspicion that there are things it doesn’t want us to see or the world to know about its military operation there,” said Sarah Leah Whitson, Middle East director at Human Rights Watch. “If Israel has nothing to hide, why is it refusing to allow us in?” Human Rights Watch requested permission to enter Gaza on January 5. After weeks of delay, the IDF rejected the application on February 9, on the grounds that Human Rights Watch “was not registered with the [Israeli] Ministry of Social Affairs.” On all previous occasions, including several times in 2008, Israeli authorities permitted Human Rights Watch staff to enter and leave Gaza via the Erez crossing. The IDF never previously suggested such a requirement for access to Gaza, and Human Rights Watch is not aware of any such Israeli law or regulation. The IDF has not responded to Human Rights Watch’s requests for clarification. GAZA – The question “Who is it?” was answered with: “The Israel Defense Forces.” Majdi Abed Rabbo, 39, who is a Palestinian Authority (Ramallah) employee and a member of its intelligence apparatus, went down to open the door. Standing there was the son of his neighbors, Mahmoud Daher, and behind him a soldier whose rifle was jammed into Daher’s back. The soldier pushed Daher aside and aimed the rifle at Abed Rabbo. “He ordered me to pull down my pants. I pulled them down. He demanded that I raise my shirt. I raised it. That I turn around. I turned around,” Abed Rabbo related. And then the room filled up with soldiers. “Twelve, or something like that.”This was in the morning of Monday, January 5, 2009, about 40 hours after the start of the Israeli ground offensive in Gaza.The soldiers had already taken over Daher’s house on Sunday evening, located in I’zbet Abed Rabbo, an eastern neighborhood of Jabaliya city. First they gathered the family on the ground floor. Gunfire rang out around the house. Then they moved the family up to the first floor. The family wondered why the soldiers had taken them upstairs, to the cold, uncomfortable room – parents, children, two infants and an elderly mother. But they could not refuse, and they did not yet know that the move upstairs brought them closer to the range of fire. Only later did they learn about the three fighters from Iz al-Din al-Qassam, Hamas’ military wing, positioned in the empty house to the northeast of them. The regular occupants of the house, owned by their neighbor Abu Hatem, had long since gone abroad. Abed Rabbo’s tall house stood next to Abu Hatem’s narrow, empty one. At about 7 A.M. on Monday, the soldiers took Shafiq Daher – a 53-year-old financial manager who gets his salary from the PA in Ramallah – as well as Mahmoud and two other sons from their home, and then separated them from each other. Mark your calendars – the 5th Annual Israeli Apartheid Week will take place across the globe from March 1-8, 2009! First launched in Toronto in 2005, IAW has grown to become one of the most important global events in the Palestine solidarity calendar. Last year, more than 25 cities around the world participated in the week’s activities, which also commemorated 60 years since the expulsion of the Palestinian people from their homes and land in 1947-1948. IAW 2008 was launched with a live broadcast from the South African township of Soweto by Palestinian leader and former member of the Israeli Knesset, Azmi Bishara.This year, IAW occurs in the wake of Israel’s barbaric assault against the people of Gaza. Lectures, films, and actions will make the point that these latest massacres further confirm the true nature of Israeli Apartheid. IAW 2009 will continue to build and strengthen the growing Boycott, Divestment, and Sanctions (BDS) movement at a global level.